The EcoHitch® stealth hitch for the 2011-2015 Chevy Volt is designed to be completely hidden with a removable receiver so you don't have to see a crosstube underneath your vehicle. This hitch has as much refinement in every detail as your Volt and makes it so you can take your bikes, extra cargo and so much more! Rated for 300 pounds tongue weight and 2,000 pounds towing weight, this Chevy Volt trailer hitch won’t make you leave anything behind on your next big journey. *If you’re going to be towing and need trailer wiring, click here! Ensure your wiring harness does not drag on the ground by visiting our Eclipse trailer wiring bracket. The Chevrolet Volt has a spectacular design and unbelievable efficiency, so you want a hitch that won’t change either of these features. 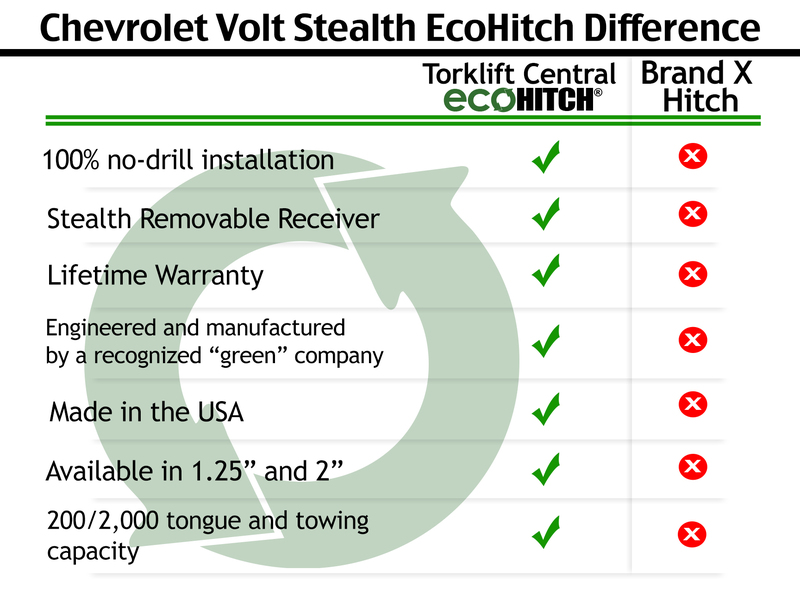 With the EcoHitch Stealth hitch, you are getting a trailer hitch for Chevy Volt that has as many great design features as your Volt does especially since it’s Eco-friendly and made with recycled materials. A perfect hitch for the Volt, the EcoHitch gives you the freedom to uphold its fuel-efficient drive and still have abundant style and performance. The EcoHitch® stealth hitch for the Chevy Volt comes in both 1¼” and 2” receiver sizes so you get your choice of which bike racks and cargo trays that will work best for the receiver you choose. The Stealth hitch gives you the option of removing the receiver so the hitch is completely hidden when not in use. With 300 pounds tongue weight and 2,000 pounds towing weight capacity you know the EcoHitch has the strength to help you bring any items that you need on your next big journey. x7180 38.7 lbs 45" x 13" x 18"
x7181 35.4 lbs 45" x 13" x 18"